﻿ E-ink-Reader. SD AND MICROSD CARDS. The most part of electronic books is equipped by the slot for connection of flash cards. Use of replaceable flash cards is very conveniently. The e-book reader can use some people, everyone with their personal flash card. It is possible to work separately with a card, having inserted it into the phone or the computer. If you do not satisfied with the volume of internal memory of the e-book reader, it is possible to buy a flash card of great volume and to store on it all you library. There are two standard sizes - SD and microSD in modern electronic books uses cards. The first had been developed SD-card. Subsequently for use in small mobile devices the card case had been reduced, such card receives the name microSD. 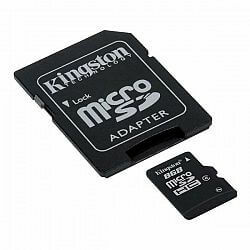 Many microSD flash memory cards are on sale complete with adapters - from size micro-SD to the size SD. It allows to establish microSD a map both in microSD - and in SD-slots. The memory capacity flash cards . For today in shops it is possible to buy flash cards of an memory capacity from 2 to 64Gb. What to choose? For example, if to take for the average size of books 850 - 900 kilobyte, on a card in capacity 2Gb will be stored approximately 2200 - 2500 books of formats FB2, MOBI, EPUB. For what time you will read such quantity of books? However, if you read books of format PDF or DJVU, which approximately in 6-10 times more on volume it is expedient to take a card more of memory capacity. Type of SD-cards On each card the type necessarily is labeled: SD Or SDHC . SD-Standard has originally been developed. Such maps have of an memory capacity to 2 gigabytes. Some manufacturers of electronic books demand use of such maps for a installing of the e-book reader. SD-cards a larger of an memory capacities have type SDHC. These standards are compatible not completely. If your device (the electronic book or card reader) supports only the standard SD - SDHC flash memory cards in such device will not work. If the device supports SDHC-standard then it is possible to use and SD - and SDHC-cards (microSD and microSDHC). To be assured that your e-book reader will support to SDHC-card, it is necessary to find as much as possible admissible memory capacity of an SD-card in the maintenance guide. If it more than 2 Gв - support of SDHC-standard it is. SD-card class. The flash card class means the maximum possible speed of reading and data recording. On the card the class is displayed by means of number in the broken off circle. The class 2 - makes speed 2 mbit per second, a class 10 - 10 mbit per second. The above a card class, the above its price. For reliable work of electronic books is advised to get slower (a class 2 or 4) flash cards. Electronics of many e-book readers can not keep up with high-speed SD-cards. As a result, the electronic book with such card either will not work at all, or will work with errors and lags. For recording and reading information from flash cards use special devices - card readers. They are installed as in the computer case, or connected to it by means of socket USB. Smallest of card readers have the size of a usual flash card. At card readers purchase it is necessary to make sure of support of the standard of cards SDHC .